The head of Central Command spoke before the Senate Armed Services Committee. The top U.S. general in the Middle East says the U.S. military's mission in Iraq is still focused on defeating ISIS, and has not shifted to "watching" Iran as President Donald Trump said in an interview this past weekend. Gen. Joseph Votel, the commander of U.S. Central Command, also told the Senate Armed Services Committee that he was "not consulted" by Trump before the president announced in mid-December that he was ordering the withdrawal of all U.S. troops in Syria, claiming ISIS ther had been "defeated." 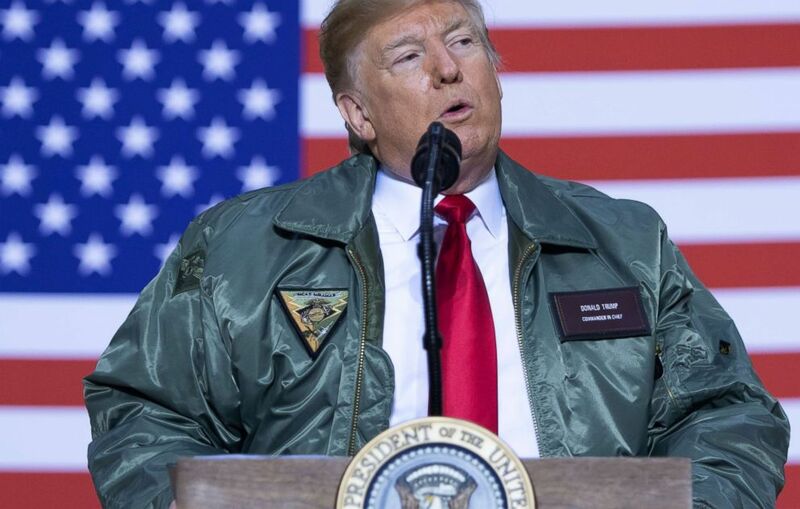 (AFP/Getty Images, FILE) President Donald Trump speaks to members of the U.S. military during an unannounced trip to Al Asad Air Base in Iraq, Dec. 26, 2018. Asked if the U.S. military in Iraq will shift its focus to "watching" Iran as Trump first brought up in a CBS interview on Sunday, Votel replied, "It has not." Trump's comments have angered Iraqi politicians, some of whom have called for U.S. troops to leave the country. "I think the government of Iraq understands the relationship, the view that we have on Iran and understands our concerns with Iran and the variety of destabilizing activities that they carry out around the region," Votel added. "But having said that, our military mission on the ground remains on the reason that the government of Iraq and that is focusing on the defeat of ISIS and now preventing a resurgence of that particular organization," he said. (Delil Souleiman/AFP/Getty Images) U.S. forces' vehicles and structures are seen on the outskirts of the northern Syrian town of Manbij on Dec. 26, 2018. Trump also said in the CBS interview that the U.S. would carry out airstrikes in Syria from inside Iraq and that some of the forces withdrawn from Syria could stay in Iraq to carry out attacks against ISIS in Syria, if needed. "We are working through a variety of planning scenarios for how we would potentially do, continue to maintain pressure on ISIS as we withdraw out of Syria," Votel told the committee. Trump announced in mid-December that he was ordering the withdrawal of the 2,000 U.S. troops in Syria. "I was not aware of the specific announcement," Votel told the committee. "Certainly, we are aware that he had expressed a desire and intent in the past to depart." "I was not consulted," he added. Since Trump's announcement, the U.S. military has removed some equipment and supplies from Syria, though no U.S. troops have left. 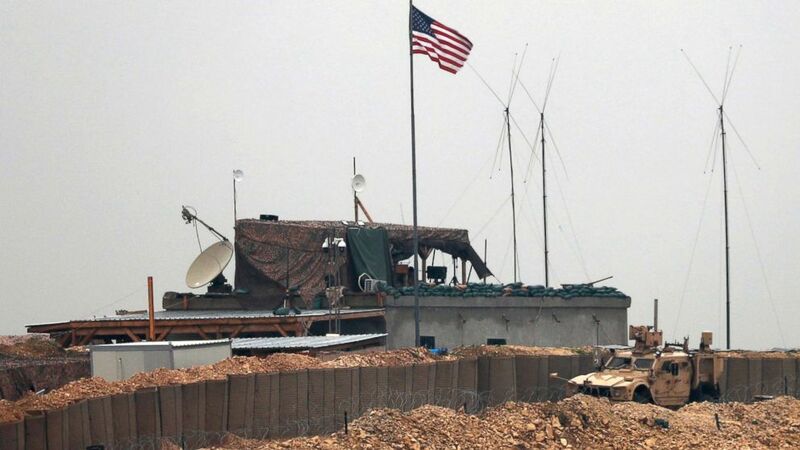 According to two U.S. officials, the number of U.S. personnel inside Syria has increased to 3,000 as additional personnel have entered Syria to prepare for the exit of troops and equipment. Votel said he was not under pressure to withdraw U.S. troops from Syria "by a specific date" and had not "had any specific conditions" placed on him. “I don’t consider this to be either time-based or conditions-based," said Votel. "The fact is the President made a decision, and we are going to execute his orders here to withdraw forces from Syria." Votel expects that U.S.-backed Kurdish forces in Syria will be able to defeat the last remnants of ISIS before the U.S. begins the withdrawal of its forces. In his opening remarks, Votel said, "The fight against ISIS and violent extremists is not over," but added that U.S. ground forces will depart Syria "in a deliberate and coordinated manner." He added that details about the pace of that withdrawal are currently being developed with U.S. allies and partners. Votel said there were different ways "to continue to keep pressure on this network that I think is absolutely vital,"
He said, "We should expect that [ISIS] will attempt to attack us and regenerate themselves, and we will continue to put pressure on them to prevent that." He said U.S.-backed Kurdish forces will proceed cautiously in that last fight given the number of civilians in the area as well as the large number of "extreme explosive hazards". The general said the U.S. intelligence estimate that there are still 20,000 to 30,000 ISIS members in Iraq and Syria was of "low and moderate confidence." The said that for the most part, those ISIS supporters have "gone to ground" and are "geographically dispersed" in open areas across Syria and Iraq.